Hello children, fancy a chat about muck-raking tech rags? The meltdown in corporate spin at IBM was apparent last week after the flames of publicity were fanned by The Register's report on the firm's proposals to redeploy tens of thousands of Global Technology Services staff. Insiders gave us sight of an internal IBM document that was distributed to senior execs and which detailed a 2018 plan of action for 30,900 employees - one-third of GTS's worldwide workforce. On the advice of consultancy Bain & Company, it appeared IBM planned to move 9,300 people into new roles, had classified 10,100 as "attrition w/o backfill", and would use the remainder to do the work previously performed by cross-company resource or external services personnel. Some 5,500 were coldly described as "remaining to solution", meaning IBM had yet to work out what to do with them next. IBM's PR handler told us the company was not going to comment on the contents of an "alleged document". That was until we pointed out an earlier conversation when the department had confirmed its existence. Then IBM sent us a fresh statement that we ran in full. As IBM has said in the past, we are focused on redeploying and reskilling our workforce globally, and IBM is substantially increasing its investment in professional development and technical training to focus on strategic initiatives. The story was published and not one person called The Reg to tell us we were incorrect. Not one. When newswire Reuters picked up our story, IBM's marketing mouthpieces changed tack, saying they were not going to comment on speculation. And in any case, "Many consultants recommend things to IBM, many of which remain merely recommendations," IBM stated. If that is the case – and our insiders told us this initiative is real – it is reassuring for both IBM staff and investors that the company is hiring expensive consultants and discarding their opinions. How does IBM let its senior people know which slides to take seriously and which to mentally bin? What is the protocol for IBMers when a slide detailing plans that impact thousands of people lands in their inbox. 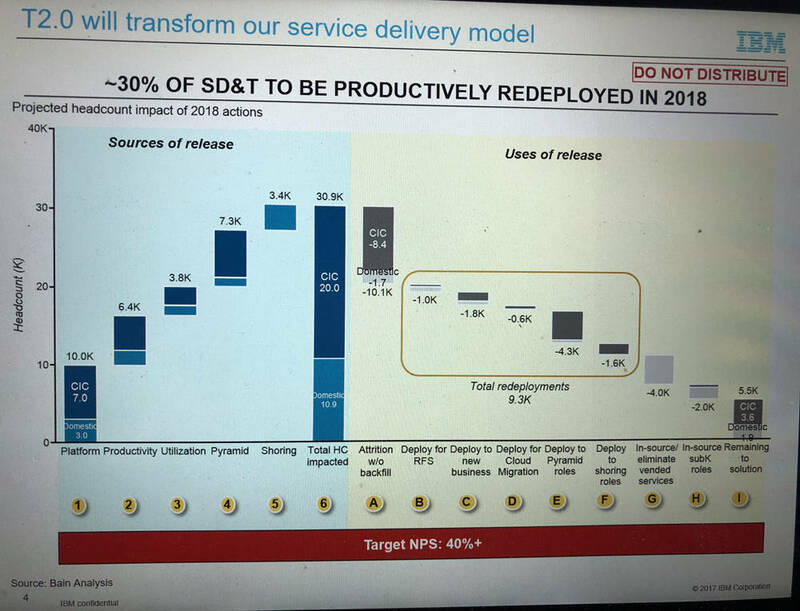 Does IBM send all strategy slides irrespective of plans to implement them? We're not sure. IBM's workforce, particularly in front line field services, should be the company's crown jewels. They are its feet on the street. Appearances are everything. So behind closed doors, IBM tried to convince its people, via a intranet post, that El Reg was muck-raking, that our piece contained "unsubstantiated rumours". "We want to assure you that the story had a number of inaccuracies and false implications and attempted to put an unattractive spin on what is otherwise a positive effort at redeployment and retraining of IBM personnel." The IBM memo continued: "We continue to reskill and redeploy talent in GTS in order to have the most contemporary skills and stronger delivery capabilities in the industry. GTS will continue to make significant investment in 2018 in professional development and technical training to focus on our Strategic Initiatives, such as Cloud, Cyber Security snd Analytics. "Skills in these areas will not only help us better serve our clients, they will also provide opportunities for our practitioners to develop or strengthen their skills, which are in demand in our current market. We also believe having the best skills will enable IBM to respond to our clients’ needs more quickly and nimbly”. "Like every business, IBM reskills its workforce to meet emerging client requirements. IBM is proud to be in the forefront of workforce training and development," the internal memo added. The Reg editorial team works hard to get the facts straight and we took plenty of time to get this story right for obvious reasons: people's livelihoods are at stake. Again: at no point post-publication did IBM call us to dispute our report or the facts contained within. We feel it is only fair to point this out to counter IBM's commentary to staff. This is why IBMers continue to give us sight of internal documents. The direction of travel within GTS, as multiple sources have told us in recent years, is to reduce the workforce in the West and push positions to lower cost regions, including India and Eastern Europe. This is because fewer customers want to sign big ticket contracts in the era of the cloud. With this in mind, IBM has run repeated redundancy programmes in Europe and the US over the past few years, offering nothing but statutory minimum redundancy terms. This has served to depress parts of the staff base in GTS, who have felt for some time like they were part of a decaying orbit floating around IBM, while the "Strategic Initiatives" represent the corp's future.